Starring Liv Hill, Sinead Matthews, Henry Lile, Jemima Newman, Cyril Nri, Angus Barnett and Tomos Eames. A teenager struggling with the fact she’s acting as a carer for her younger siblings and ill mother finds a way to channel her frustrations into stand-up comedy. If movies reflect the time period in which they are made, it’s no coincidence that British cinema is currently choosing to spotlight the bleak plight of working class people. 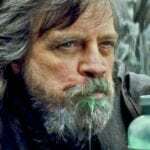 From the tyrannical benefits system in I, Daniel Blake to the constant financial misfortune of the protagonist in last year’s underseen Sink, movies set in the UK are currently about as sad as they come. 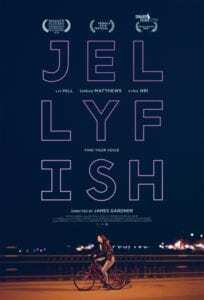 Jellyfish, from debut feature director James Gardner, certainly doesn’t shy away from the darkness of its characters’ predicament and feels like a worthy addition to the new kitchen sink canon. The movie opens with a series of shots of Margate – occasionally an enjoyable seaside getaway for Brits sick of the city but, out of season, it’s something of a grey wasteland. This is home for 15-year-old Sarah (Liv Hill), whom we meet serving raw Super Noodles to her younger siblings when the electricity meter runs out before the kettle can finish boiling. Her mother suffers from mental illness and is seldom able to get out of bed, forcing Sarah to balance her schooling with part-time work at a seafront arcade. Hill is the anchor at the heart of this movie and, fittingly for her character, delivers a performance with maturity beyond her years. Sarah is a troubled young woman, forced to endure some horrible things in order to keep her family afloat, and she has little time for school. But Hill’s performance has more layers than simple misery, from the brave, charismatic facade she puts on for her siblings to the confrontational rebel image she presents in front of her classmates in performing arts lessons. It’s in these lessons, after a foul-mouthed roast of her privileged fellow pupils, that Sarah’s teacher – Cyril Nri on scene-stealing comic form – makes the suggestion that she pursue stand-up comedy for their upcoming talent showcase. She’s next seen giggling along to Frankie Boyle in the school library and jotting down some of her own gags, briefly forgetting all of the chaos surrounding her life outside of the classroom. The main weakness of Jellyfish is that it can’t find time for more of these scenes, as when Sarah declares in the third act that stand-up is the only thing she has ever loved, it doesn’t quite ring true. What does ring true, however, is the depiction of Sarah’s rough family life. Sinead Matthews, as her mother, is terrific as a troubled woman whose mood changes with the weather. Her performance is surprisingly subtle given the potential for the character to be an insensitive caricature and it always feels as if she’s earnestly trying to be a good mother, despite the fact she continuously makes all of the wrong decisions. Her interplay with Hill feels entirely natural, with Hill given room to express the full gamut of emotions in the wake of her mother’s unpredictability. The setting, too, serves to evoke the bleakness of Sarah’s life. Gardner’s desaturated, grey take on Margate positions it as a place of contrast, where what serves as an escape for holidaymakers is a cage ensnaring Sarah’s potential. In one of the movie’s bleakest narrative moments, Gardner’s camera walks away from an act of violence, through the amusement arcade and holds on a shot of the seafront for an impossibly long time, as if suggesting the entire concept of a coastal holiday town is a gaudy facade hiding misery beneath it. A funfair called ‘Dream Land’ feels like a particularly bitter twist of irony and, when a sleazy estate agent tells Sarah that the town is about to become “Shoreditch by the sea”, the reaction is one of derision. That derision, however, proves to sit at the heart of Sarah’s stand-up journey. Her material, crucially, isn’t necessarily good or even particularly funny, but rings true as to the work of someone experimenting with comedy as a way to explore the hurt of their life. This isn’t a movie that follows the cartoonish and uplifting underdog story template, but one that effectively follows a woman using creativity to explore what her place in the world might be. With Hill’s natural, potent performance at the centre of that narrative, Gardner is able to locate the heart of these characters and twist the emotional knife in just the right way. On top of all that, the sentimental heart of the film is a packet of Space Invaders. There’s not a single more effective nod to endearingly naff Britishness than that.